Our rooms are cheery with large windows and are decorated with residents’ personal belongings which makes the room feel more like home. Our 384 sq. ft. spacious private suites provide normalcy to the life of the resident and their family. Each suite includes a private bathroom and kitchenette. Our suites are Aging in Place. 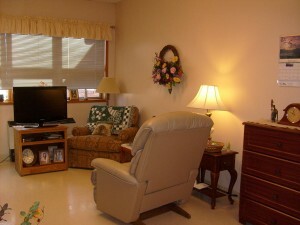 Residents in the suites can bring along their beloved pet to live with them. The suites will give the resident a sense of ownership and a place to call home. Your Beloved Pet is able to live with you *small deposit required.